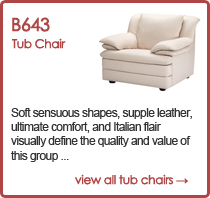 The tub chair is a popular choice, with its contemporary look at affordable prices. Stylish and comfortable, a tub chair is the perfect solution for many seating dilemmas – it is equally at home in the lounge, conservatory, bedroom or study. Large enough for comfort, yet small enough to be easily accommodated in most rooms, the tub chair can be effortlessly styled with a contrasting scatter cushion or throw. Consider using items with different textures to create an interesting look. An elegant and classical seat, a leather tub chair will give an opulent look to any room. Our leather tub chair collection exudes style and quality with understated charm. 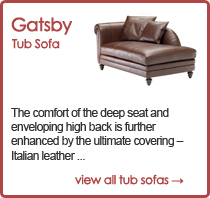 A tub sofa is the ideal solution for comfort and style where space is limited. Perfect for smaller rooms, a tub sofa can give the impression of space without compromising on quality or design. A great solution when extra cupboard space is needed, ottoman storage provides hidden room for tidying away toys, linens, CDs and DVDs. 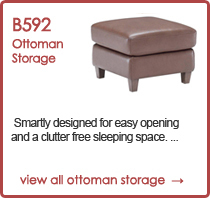 Making your things easily accessible, an ottoman storage chest is perfect for an uncluttered look. Many a tub chair will find its way into student accommodation and teenagers’ bedrooms, where it will often have a dual purpose, as a seat for both relaxation and study. 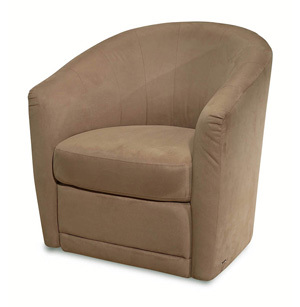 A tub chair will often have removable covers which are machine washable, making cleaning trouble-free. With its understated elegance and simple lines, today’s tub chair shares a very similar form to Hoffman’s Koller tub chair, designed in 1911, which reflects the strong influence of Art Deco, with elements of the Arts and Crafts Movement. And whilst a genuine Hoffman antique would cost a considerable sum of money, a tub chair from our fabulous range provides a comparable look at a fraction of the cost. A classic piece of furniture, a tub chair will grace any home. Where will you put yours?